Previously it was previously demonstrated that an electric current flowing through a wire gives rise to a magnetic field whose direction relies on the direction of the current.See magnetism from electricity. 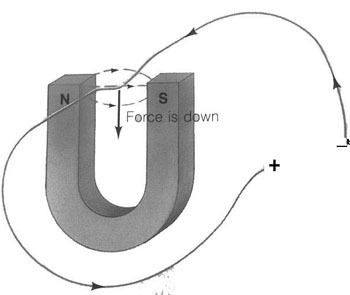 It can also be demostrated that a magnetic force exerts a force on a wire carrying current. 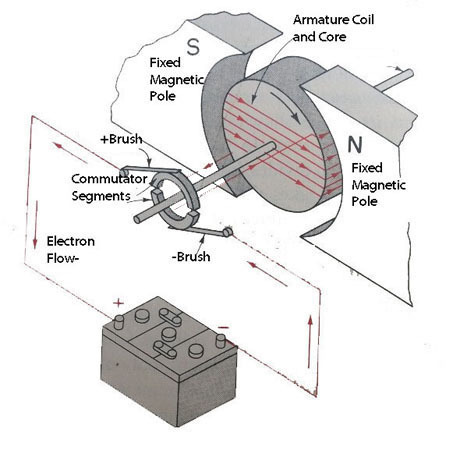 Pass a wire through a magnet as shown below and attach to a batter (Direct Cureent)y. A force in the down direction will force the wire to be pulled down. 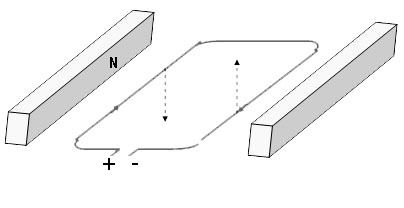 If we now insert a loop instead of a wire between a magnetic field (see image below), the left side o the loop will be pulled dowh and the right side will be pushed up. But as long as the direction of the current stays the same the loop will not rotate-- it will just line up with the magnetic field of the magnet. To get the loop to rotate we need to get the current to constantly switch direction. If an AC (alternating current is applied instead of DC the wire loop would rotate. There is a way however to get the loop to rotate using DC (Direct Current). 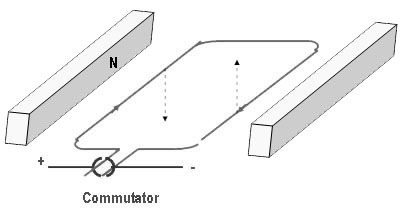 By adding the "split" commutator the direction of the current in the coil will reverse every half turn and provides the conditions necessary to keep the coil in constant rotation.